When Jim Henson created the Muppets, he never intended them to be mere vessels for pop culture references. He put as much thought into their personalities as he did into their physicality, brought to life by an innovative hybrid of puppetry and marionette performance techniques. In 1979’s “The Muppet Movie,” Kermit’s desire to “make people happy” mirrored Henson’s own, and the frog’s ever-growing group of friends and fellow dreamers were not all that unlike the devoted collaborators (such as Frank Oz, Dave Goelz and Richard Hunt) who joined Henson on his creative journey. The movement and behavior of these hand-crafted marvels were so richly detailed that they seemed every bit as lifelike as their human co-stars. These were creatures with anxieties, aspirations, inhibitions and existential crises. They were real. After Henson’s death in 1990, the Muppets gradually lost their way. They needed a personal vision to revitalize their purpose, and that is precisely what devoted fan Jason Segel brought to 2011’s marvelous film “The Muppets,” a love letter that reflected the co-writer/star/producer’s own efforts to bring the franchise back to its roots. Now writer/producers Bill Prady (“The Big Bang Theory”) and Bob Kushell (“3rd Rock from the Sun”) are aiming to take Henson’s creations back even further, before their names were synonymous with children’s entertainment. Henson truly believed that puppetry could engage audiences of all ages, and had strived to make films (“The Dark Crystal,” “Labyrinth”) and television (“The Storyteller,” his “Saturday Night Live” sketches) that were geared toward older viewers. Prady and Kushell’s “The Muppets,” premiering at 7pm CST tonight on ABC, seeks to win over a prime-time audience with adult humor that will push the envelope without alienating younger viewers. It’s a tricky balancing act, and the first two episodes—while far from flawless—have more than enough promise to keep even Statler and Waldorf enticed. For perhaps the first time since “The Muppet Show,” Henson’s landmark series satirizing variety shows of the ‘70s, Kermit and the gang appear entirely unguarded. They aren’t putting on an act or straining to appease a particular demographic. It’s as if Prady and Kushell took the priceless blooper reels (found on various Muppet DVDs) as the chief inspiration for their approach. I always loved how the Muppeteers, after flubbing a line, would stay in character, muttering sardonically to each other like charismatic showbiz veterans. If Fozzie and Gonzo were truly uncensored, what would they say to one another? Therein lies the premise of “The Muppets,” which pokes fun at both late night shows and faux documentary-style sitcoms modeled after Reality TV. As in the excellent 10-minute pitch video released online in July, the Muppets frequently break the fourth wall, commenting on the artificiality of their program’s designated format. Cutaway gags in the form of interview excerpts, where characters’ comments are contradicted by the juxtaposed footage, are dismissed by Gonzo as an “overused device,” just before he’s seen praising the very same idea at a board meeting. 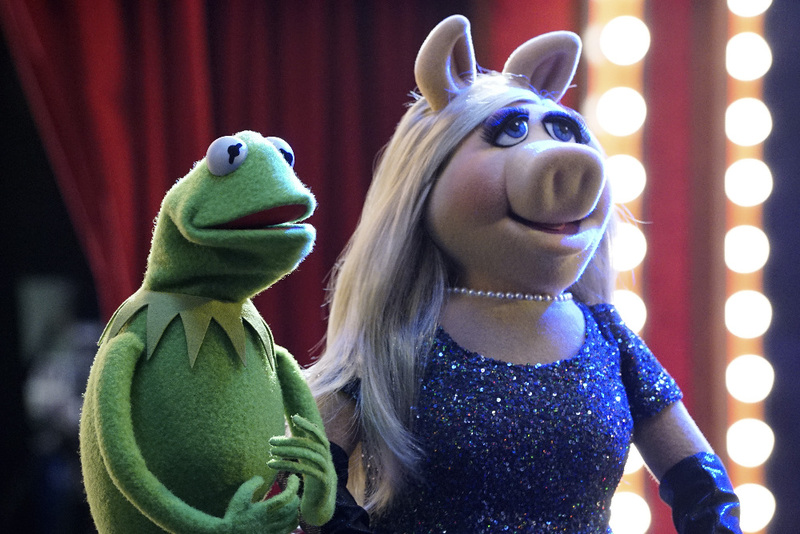 The much-publicized break-up between Kermit and Miss Piggy brings a new level of tension to their latest project, a show featuring the porcine diva as the first female late night host. A flashback to the quarrel that ended their relationship is not played for laughs, and it’s clear that Kermit feels as if she has taken his longtime—often long-suffering—devotion to her for granted. Perhaps Kermit read Roger Ebert’s review of “The Muppets Take Manhattan” in which the critic advised, “Dump Miss Piggy. Stage a talent search for a Liza Minnelli Muppet. Mickey Rooney made a lot of movies with Liza's mother before you were hatched, Kermit, and now it's your turn. Move fast, kid, before you croak.” Regardless, the frog’s newfound liberation makes him a stronger character than ever, and Steve Whitmire (who took over the role following Henson’s passing) brilliantly explores new sides of his character’s psyche, not to mention a few of his private fantasies. Kermit has always been the most expressive Muppet, with his felt face enabling the merest flicker of a finger to convey vivid nuance, and Whitmire takes full advantage of its flexibility. By far the best idea in both episodes screened for critics is the subplot in which Fozzie (Eric Jacobson) embarks on an interspecies relationship with a young woman, who brings him home to meet her parents. Their painfully awkward dinner conversation is fraught with the sort of social satire that Norman Lear once made his trademark, and though the concept isn’t quite milked for its full potential, it serves as a hopeful sign of the sophisticated wit to expect from this season. As for the guest stars, they’re all fairly lackluster thus far. Most of them are predictably culled from ABC’s roster of celebrities, though Tom Bergeron—a man of no discernible talent, as far as I can tell—earns points for being a good sport, as the Muppets’ unimpressed reaction to his booking on “Up Late with Miss Piggy” will undoubtedly match the viewer’s own. The challenge facing Prady and Kushell is to ensure that their show doesn’t simply ridicule “overused devices” before proceeding to utilize them like any other show on television. They must continue to subvert modern pop culture as Henson did, rather than submit to it. And if they want “The Muppets” to grow past the stage of a clever novelty, they must allow the humor to spawn organically from the characters themselves, rather than topical parodies. It’s easy being green when you deflect your greenness with cheap cutaway gags. It’s not that easy being green—and owning it.